This page's purpose it to try and answer any general questions people have about rabbits, or my rabbits. That way, you don't have to send an email for just one general question, when it can be answered here (not that I don't enjoy talking through e-mail, because I do!). If your question was not answered here, or you would like a more specific answer, or have a 'Question and Answer' you think should be on this page, feel free to e-mail me with it! My e-mail can be found under the 'Contact Us' page. **Note: All answers are from my knowledge and experience. I am not responsible for anyones decision made based off of these answers. A: Mini Lops have a maximum weight limit of 6.8 pounds, where Holland Lops have a maximum weight limit of 4 pounds. Mini Lops also tend to have a sweeter personality than Hollands do, because they aren't as high strung (what I've been told). A: Well, does can get pretty territorial when they hit the breeding age (4-6 months) and can often get aggressive because of it. Bucks arn't any better, fore they tend to spray. Bucks also like to hump with inanimate objects and can lead small children to not understand what they are doing. But there's hope! This can all be fixed with a neuter or spay. Just contact your local Vet. and they'll know what to do. BUT, if you are planning on showing the rabbit, it CANNOT be neutered or spayed, and it's against the rules. Q: (I/We/My Child) wan't to show the rabbit, but don't want it to be aggressive or spray, what do we do? 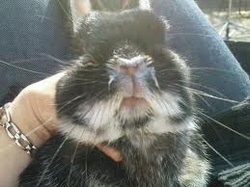 Q: My rabbit is constantly sneezing, isn't eating, and drinking little to none. What is going on? A: Your rabbit could possibly have Pasturella! Pasturella is also known as 'Snuffles'. Snuffle's is a very contagious illness and could terminate a rabbit very quickly. It must have picked it up from another animal. -If it has any discharge coming from the nose, make sure to wipe it up whenever you see it. This will make the rabbit more comfortable, and help from spreading to other rabbits. -Make sure the bunny always has hay in it's cage. If it doesn't eat the hay, then you have to start force-feeding. Go to the Vegan section of your local grocery store and find whats called 'Goat Milk Yogurt- Plain'. Then, stop by a pet or feed store and get a syringe. You want to fill the syringe with the yogurt and flip the bunny to it's back. Then slowly slide the syringe in it's mouth and start feeding. Bunnies always love this stuff. Do that about twice a day. -If your bunny has a bloated belly, gently massage it as much as you can. I've heard of people using Pepto Bismal aswell. Don't use to much or it will stop up the bunny and make a bigger mess. I would call your local Vet to ask how much to give. Q: My rabbit is always digging in their cage, why are they doing this? A: Rabbits have a natural instinct to dig. Notice when in the wild, they live in burrows? They dig those to shelter themselves and their babies. No, this doesn't mean your rabbit is pregnant, it's just something they do. Sometime's it also means they are sexually frustrated, and want to mate.